For more than a decade, Ron has worked at Cisco as the vice president of executive and customer engagement to develop and nurture a culture of sharing collaborative processes. Ron’s work lays out in 21st century terms the increasing need to have global reach and connect with teams around the world. 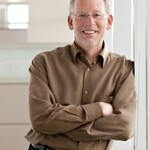 He is co-author of The Collaboration Imperative, a beautifully designed book that is very accessible, fun and engaging. In it, he weaves both his experience at Cisco as well as other organizations to understand and encourage new approaches to teamwork. Listen to my interview with Ron Ricci.